In a search for new vistas and growth, my husband had been scanning employment ads across the country and applied for a job he was well-suited for with a large corporation. He received two interviews by telephone and SKYPE. The new job would require us to move several provinces, leaving family, friends and a community we were attached to. He received confirmation by telephone that the corporation wanted to hire him. We spent a few days agonizing over a decision, consulting with family and friends, praying about it, and decided my husband would accept the job. After his verbal acceptance, a contract followed a few days later, which he duly signed and sent back. He was told it had been signed at the other end and he could now announce the new job publicly. He gave notice to his present employers, as did I mine, and we proceeded to take steps to put our house on the market, search for housing in the new city, and pack. We had begun to say good-bye. Three days later a phone call came from the HR Department of the corporation saying they had to rescind the contract as someone “higher up” had not given approval for it. We were stunned. There had been no hint in any part of the process that the job offer was in any way tentative or not thoroughly vetted. 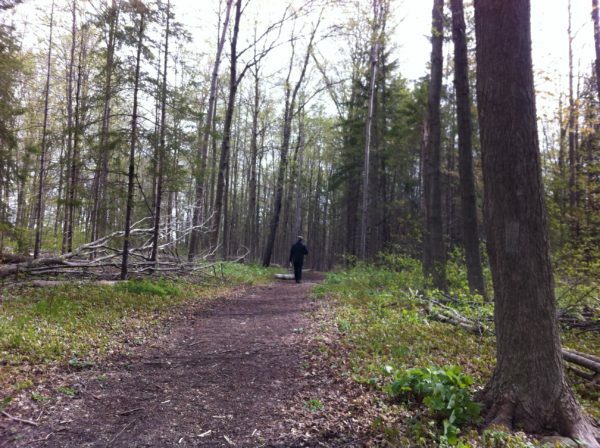 We had taken many steps forward, and now had to backtrack several steps. My husband had to go, hat in hand, to his current employers to see if he could retain his job. After a painful good-bye session with my team I had to inform them that I was not leaving. This whole experience has brought to mind the importance of what my employer, BERTEIG Inc, is attempting to do through agile training, consulting and coaching. These are prime values to be lived by small and large businesses. Admittedly, Agile was initially created for software developers, but more and more corporations and organizations are seeing the value in being agile, and are responding to this necessary change of culture in what is currently a time of deep disruption. If some “higher up” had not actually given approval for this hiring, once the contract was signed at both ends (which it was), could this higher-up not have responded with more agility, more compassion, and more ethically? What if he had acted in such a way that, even if he did not approve the contract, he acknowledged the good intentions of both sides and let it go? After all, his corporation was getting a highly-qualified, experienced employee. What if he was transparent and acknowledged that the contract was not to his liking, and asked would my husband consider some other version of it? 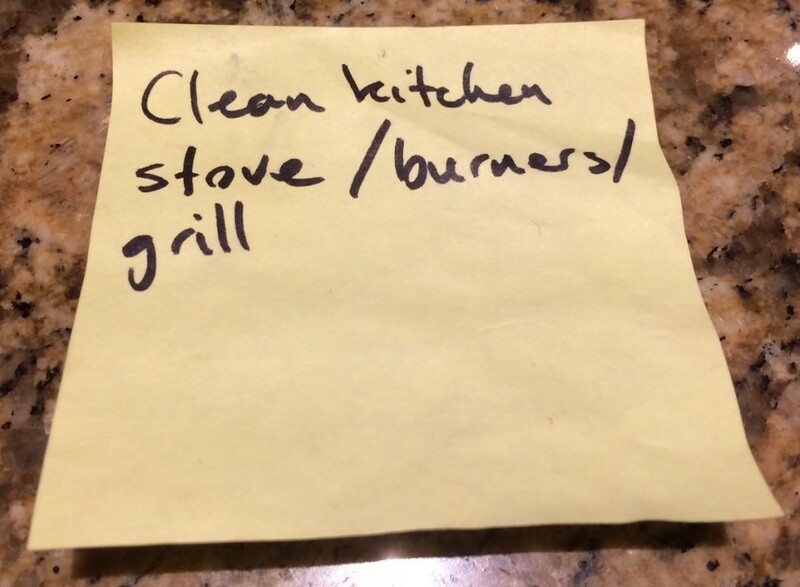 And then consulted directly with my husband and HR over certain changes to the contract? And made sure everyone was agreeable with the changes? 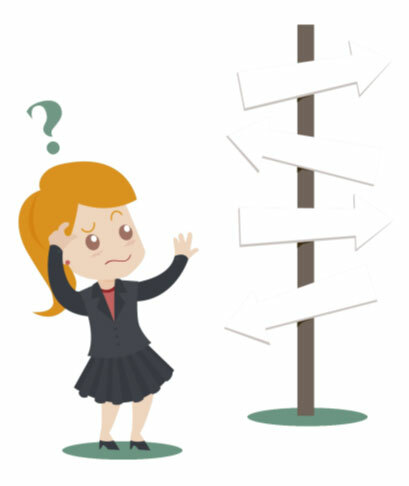 What if the “higher-up” just called my husband directly, apologizing that the contract was made without his say-so, that they were not in a position to hire him, and offered two-months salary for any damages – material and emotional – that had been incurred? The above scenarios could have changed the situation from one of loss, to one of win-win for both sides. Agile frameworks are clearly proving to be of great benefit to employers and employees alike. Hundreds of eager attendees take Certified Scrum Master and Certified Product Owner training from us. 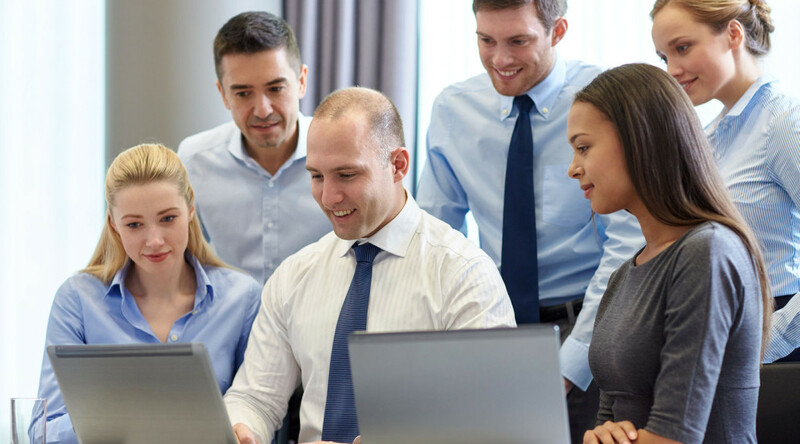 Many have taken our Certified Agile Leadership offering in cooperation with Agilitrix. Do the corporations they belong to welcome the changes these attendees are prepared to make? Are corporations taking steps to truly alter their culture? My husband was almost employed in that organization, where hundreds of others are employed. I wonder how often their employees experience this type of trauma, since this neglectful handling of my husband’s contract is a likely sign of ongoing cultural problems within. This rescinding of a contract was a losing situation on both ends. The corporation in question lost a highly-talented employee who would have been extremely loyal and hard-working (as was determined in the interviews). My husband lost professional credibility having to backtrack with his current employers. We lost the challenge of a new adventure. We’re recovering, despite this having a huge emotional impact on our lives. We’ve been agile enough to say: we’re still here, we still have jobs, we can make the best of it all. I just wish that Big Corp would get it. And soon. Before more is lost. This post marks the beginning of a new Agile experiment supported by BERTEIG. Quite simply, the idea is to apply Agile methods and principles outlined in the Agile Manifesto to a social action project at a neighbourhood level. The objective is to use the empowering principles of Agile to help eliminate the extremes between wealth and poverty. The approach is to pair up one family who has items to share with another family who is in need in order to provide a weekly care package including food and other basic care supplies. The sharing takes place in the real world with the delivery of a package weekly but also corresponds to an online platform which allows for the sharing to happen at an sustainable cadence. The initiative was formally launched three weeks ago and this video is the first which addresses some basic structures of the framework. This video is a bit like a one-person retrospective. One of the principles of BERTEIG is to strive to create unity and to be of service to humanity. This socio-economic Agile experiment is a way in which BERTEIG is reaching out to help others and contributing towards the advancement of a small neighbourhood moving along the continuum from poverty to prosperity, materially and spiritually. Despite this, it didn’t hurt to have a look for some inspiration on good retrospectives. I really liked Gitte Klitgaard’s talk called Retrospectives are Boring and Useless – Or are They? In particular the parts around preparing and establishing safety. On the theme of safety, I thought we could try to go as far as having fun; we’d already had lots of success with the getKanban game (oh Carlos you devil!). Where it all tied together for me, was being inspired by the great question-based approach from cultureqs.com that I’d had a chance to preview at Spark. If I could create a game with the right prepared questions, we could establish safety, the right dialogue and maybe even have some fun. 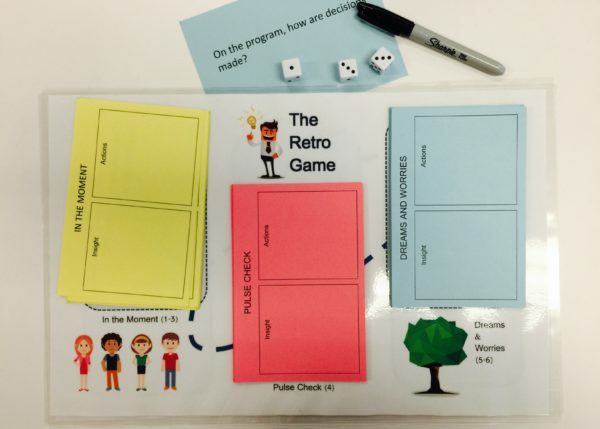 This is a question-based game that I created that you could use to conduct your next retro for teams of up to 10 people. The rules of the game are fairly simple and you could play through a round or two in about 1 to 2 hours depending on team size and sprint duration. Prep time for the facilitator is about 2-4 hours. You, as facilitator, will need to prepare for 3 types of questions that are thought of ahead of time and printed (or written) on the back of card-stock paper cards. One question per card. Each question type has its unique colour card. About 8 questions per category is more than enough to play this game. On the face-up side of the card it should indicate the question type as well as have room to write down any insights and actions. Players sit on the floor or at a table around the game board. The cards are in 3 piles, grouped by type, with the questions face down. The person with the furthest birthday goes first. It is their turn and they get to roll the dice. They then read the card question on the card out loud and then pass the card to the person on the right. The person on your right is the scribe, they will capture notes in the Insight and Actions boxes of the card for this round. Once they have read the question, they have a chance to think and then answer the question out loud to the group. Nobody else gets to talk. Once they’ve answered the question, others can provide their thoughts on the subject. After 3 minutes, you may wish to move on to the next round. At the end of each round the person whose turn it was chooses the person who listened and contributed to the discussion best. That person is given the card to keep. The person to the left is given the dice and goes next. The game ends at 10 minutes prior to the end of the meeting. At the end of the game, the person with the most cards wins! The winner gets the bragging rights (and certificate) indicating they are the retrospective champion! You should spend the last 10 minutes reflecting on the experience and organizing on the action items identified. Context & Reflection – Preparation is key, particularly for the “In the Moment” section. The topics will be relevant and connect with what the team wants to talk about. Also when presented in the form of a question they will likely trigger reflection for all those present. Sharing the Voice – Everyone gets a chance to speak and be heard without interruptions. The game element also incentivises quality participation. Coverage of topic areas – The 3 question categories spread the coverage across multiple areas, not just the items in the moment. The probabilities are not however equal, for example there is a 50% chance of “In the Moment” being chosen in each turn. Fun & Safety – The game element encourages play and friendlier exchanges. You are likely to have dialogue over debate. I’d love to hear how this game worked out for you. I’ve included everything you need here to setup your own game. Let me know how it went and how it could be improved! I recently said goodbye to one of my organization’s Agile Coaches and I felt that I needed to take a pause and reflect to consider my next move. The engagement had gone well, in fact one of the best we’ve had, but not without its share of successes and failures. But the successes had clearly outpaced any failures, and so there was a lot of good I wanted to build on. The departing coach was part of a 3rd generation of Agile Coaches that I had worked with in the 3 years since we had begun our company’s transformation to Agile. And while he was a great coach, so were his predecessors and yet they had had fewer successes. On reflection, what had really happened is that we had changed as a company; we had learned how to better execute our engagements with an Agile Coach. Deciding to hire an Agile Coach. 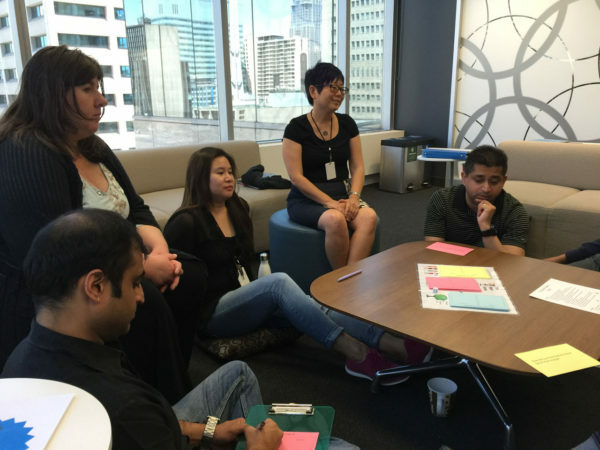 Deciding to hire an Agile Coach can be a big step. A couple of things need to have happened, you’ve recognized that you need some help or at least another perspective. And given that Agile Coaches are typically not very cheap, you have decided to invest in your Agile transformation, however big or small. You’re clearly taking it seriously. However, through my experiences I noticed that things can get a little tricky once that decision has been made. Many organizations can fall into a trap of externalizing transformation responsibilities to the Agile Coach. In essence thinking along the lines of “as long as I hire a good coach, they should be able to make our teams Agile” can take you into an engagement model that is not very Agile in the first place. Much like how Scrum and other Agile Practices connect customers with teams and establishes shared risk, an organization’s relationship with their Agile Coaches need to be a working partnership. So it’s important for you to setup the right engagement approach to get value out of your Agile Coach and this goes beyond the hard costs of their services, but also the high cost of failure with not having the right coaching in the right areas. Usually it is management who will hire a coach, and they may do so to help one or more teams with their Agile adoption needs. So in this scenario who is the customer? Is it the person that hired the coach or the teams (the coachees) who will be receiving the services? In some cases, the coachees aren’t clear why the coach is there, they haven’t asked for their services and in some cases may even feel threatened by their presence. For this reason, if management is hiring coaches you need to recognize that there is a 3-pronged relationship that needs to be clearly established and maintained. With the customer in this case being someone in management, i.e. the person who hired the coach in the first place. 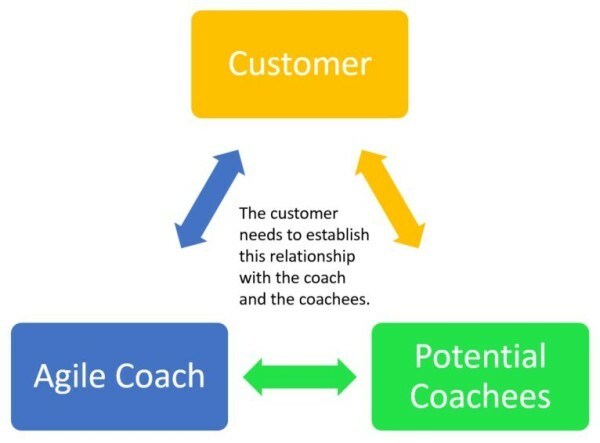 The customer’s responsibility will be to not only identify the coachee but then work with the coach to establish and support that relationship. Agile Coaches typically tend to be more effective when they have one or two specific mandates tied to an organization’s goals. Not only is the mandate important to establish why the coach is there, too many goals can significantly dilute the coach’s effectiveness. Put another way, Agile Coaches are not immune to exceeding their own Work in Progress limits. The mandate establishes why the coach is there, and should be tied to some sort of organizational need. A good way of developing this is to articulate what is currently happening and the desired future state you want the coach to help with. The teams on our new program are great at consistently delivering their features at the end of each sprint. However, we still experience significant delays merging and testing between teams in order for the program to ship a new release. We’d like to reduce that time significantly, hopefully by at least half. Once the engagement is well underway you may find that the coach, through serendipity alone, is exposed to and gets involved with a wide variety of other areas. This is fine, but it’s best to just consider this to be a side show and not the main event. If other activities start to take on a life of their own, it’s probably a good time to go back to inspect and potentially adjust the mandate. If you’re not sure how to establish or identify your Agile goals, this could be the first goal of any Agile coach you hire. In this scenario, the customer is also the coachee and the mandate is to get help establishing a mandate. Agile coaches are not a homogeneous group, with many degrees of specialty, perspective and experiences. Resist the desire to find a jack-of-all-trades, you’re as likely to find them as a unicorn. Your now established mandate will be your biggest guide to what kind of coach you should be looking for. Is the need tied to technical practices, process engineering, team collaboration, executive buy-in, transforming your culture, etc? The other part is connected with the identified coachee. Are the coachees team members, middle management or someone with a “C” in at the start of their title? Will mentoring be required or are you just here to teach something specific? 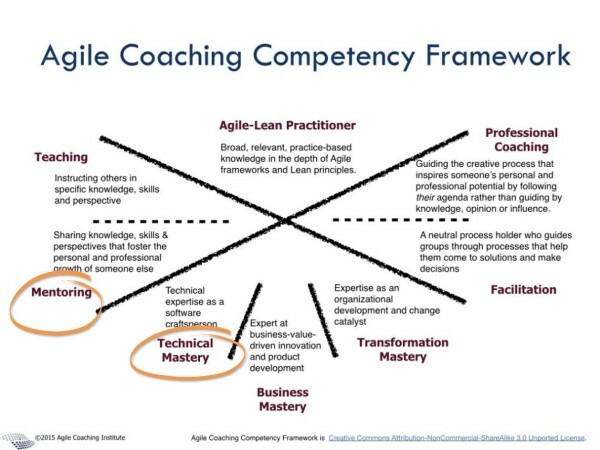 Using something like ACI’s Agile Coaching Competency Framework, would be a good model to match the competencies required of the perspective coach. In my example earlier, in order for your team to get help with their merging & testing needs, you may have to look for a coach with the right skills within the Technical Mastery competence. And if you have technical leaders who are championing the change, potentially the ability to Mentor. With the coach, customer and mandate clearly identified, you now need to be ready to devote your time to regularly connect and work with the coach. Formalizing some sort of cadence is necessary, if you leave it to ad hoc meetings you will typically not meet regularly enough and usually after some sort of failure has occurred. 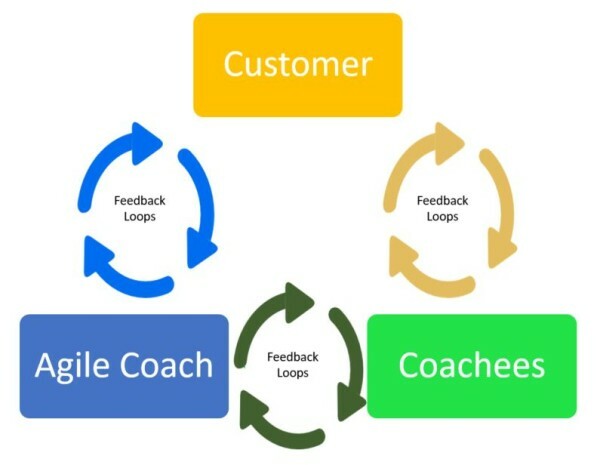 The objective of these feedback loops is to tie together the communication lines between the 3 prongs established: the customer, the coach and the coachees. They should be framed in terms of reviewing progress against the goals established with the mandate. If the coachees ran any experiments or made any changes that were intended to get closer to the goals, this would be the time to reflect on them. If the coachees need something from the customer, this would be a good forum to review that need. Resist the temptation to set the coach’s hours as a full-time embedded part of the organization or team. While you may want to have the coach spend a significant amount of time with you and your coachees when the engagement is starting, after this period you will likely get a lot more value from regular check-ins. This could look like establishing some sort of rhythm with a coachee: reviewing challenges, then agreeing on changes and then coming back to review the results after sufficient time has passed. This approach is more likely to keep the coach as a coach, and prevents the coach from becoming entangled in the delivery chain of the organization. The coach is there to help the coachees solve the problems, and not to become an active participant in their delivery. Bringing in an Agile Coach is an excellent and likely necessary part of unlocking your Agile transformation. However, a successful engagement with a coach will have you more connected and active with your transformation, not less. So consider these 5 positive coaching engagement patterns as I consider them moving into my 4th generation of Agile coaches. I expect it will be a lot of work, along with a steady stream of great results. I can already imagine how a version of me from a previous life would have responded, “yes of course let’s look at the job description and see where the SM is falling short of their roles and responsibilities”. But as I considered my response, my first thought was that focusing our attention on roles and job descriptions was a doomed route to failure. Pouring our energy there would likely just extend the pain the PO, and likely SM, were going through. Sure we have an SM job description in our organization, and it clearly documents how the SM provides service to the organization, team and PO. But reviewing this with the seasoned SM didn’t really make sense to me; they were very well aware of the content of the job description and what was expected of them. At the same time that this was happening, another newly paired Scrum Master asked for my help regarding their PO. From their perspective the PO was “suffocating” the team. The PO was directing the team in many aspects of the sprint that they felt was stepping beyond their role. “I don’t think the PO knows their role, maybe you can help me get them some training?” was the SMs concluding comment. Over the course of the next few weeks this scenario played out again through more POs and SMs sharing similar challenges. Surely this was not a sudden epidemic of previously performing individuals who now needed to be reminded of what their job was? A common pattern was emerging from all of this, change was occurring and each individual was relying on, and to some degree expecting, old patterns to continue to work with their new situation. Their old way of working in Scrum seemed to work very well; so it was everyone else around them that was not meeting expectations. The core issue however was that change was not being fully confronted: the product was different, the team competencies were different, the stakeholders were different, the expectations were different and finally the team dynamic was different all the way down to the relationship between the SM and PO. I looked for the solution from Scrum itself, at its heart a method for teams to use to adapt to and thrive with change. Was there enough transparency, inspection and adaptation going on between the SMs and POs in these situations? I would argue, not enough. A pattern was becoming clear: nobody was fully disclosing their challenges to the other, they hadn’t fully confronted and understood their new situation and hadn’t come up with new approaches that would improve things. Said another way, they hadn’t inspected their new circumstances sufficiently and transparently enough so that they could adapt their role to fit the new need. One thing that many successful SMs and POs recognize is that they are both leaders dependent on each other, and for their teams to be successful they need to figure out how they will work together in partnership. It doesn’t matter whether the terms of that partnership gets hashed out over a few chats over coffee or through a facilitated chartering workshop. What matters is clarity around how you agree to work together as partners meeting some shared goal. Do we both understand and support the team’s mission and goals? What are the product goals? How can we best help the team achieve those goals? Are there any conflicts between the team and product goals? When our goals or methods are in conflict, how will we resolve them? In what ways will I be supporting your success as an SM/PO? How will we keep each other informed and engaged? Should we have a peer/subordinate/other relationship? So if you are an SM or PO, and it’s unclear to you on the answers to some of these questions, you may just want to tap your leadership partner on the shoulder and say “let’s talk”. When my Scrum team first proposed trying mobbing I wasn’t sure what to expect. No one on the team (including myself) was an expert. I reserved judgment and watched a few sprints. I stayed silent when the same team decided to skip the tasking out portion of planning and simply pulled in enough stories to fulfill their Sprint goal. After a couple of sprints it became obvious that there were a number of pros; the team was engaged and aligned. They responded as a consistent, unified voice at Sprint Review and Retro. Planning went a lot faster as the team no longer wrote out all their tasks and didn’t have to copy all of them into Jira. Then, one of the team members introduced me to the concept of the daily goal and I watched as he walked the team thru it. I thought this made a lot of sense and so did the team. We kept up the practice. Some days the team would forget about it or be too tired to bother. I noticed on those days the team wouldn’t be as clear on what they were working on or how to align on a particular challenge. I also noticed that the Stand Up the next day would be more fragmented and meander a bit. They would forget to communicate to one another and look at me as their Scrum Master expectedly, wanting me to drive it. I started to coach the team back to their daily goal practice and reminded them this Stand Up was for them to align on the work ahead for the day. This became more important as the team divided up into mini mobs or pairs and were no longer one big mob. I find the Daily Goal useful for a number of reasons. Instead of tasking out the work a week in advance, they decide how to approach the work on a daily basis that takes into account any day to day changes that have happened. Planning goes a lot faster now that we’re not tasking out all the work in advance. The team stays focused on a daily basis as opposed to at just Planning. They write their daily goal on their Scrum Board making it visible to anyone on the floor what their focus is for the day. Even better, the daily stand up as renewed purpose and the dialogue is more interactive. I hope to continue the practice and frankly, it’s fun! Achieving short time goals is motivating and brings a sense of accomplishment. I highly recommend it. Let me know your thoughts and if you’re trying this technique let me know how it’s working out for your team. If you are a long-time reader of Agile Advice, you know I take interest in Agile methods used in non-software environments. 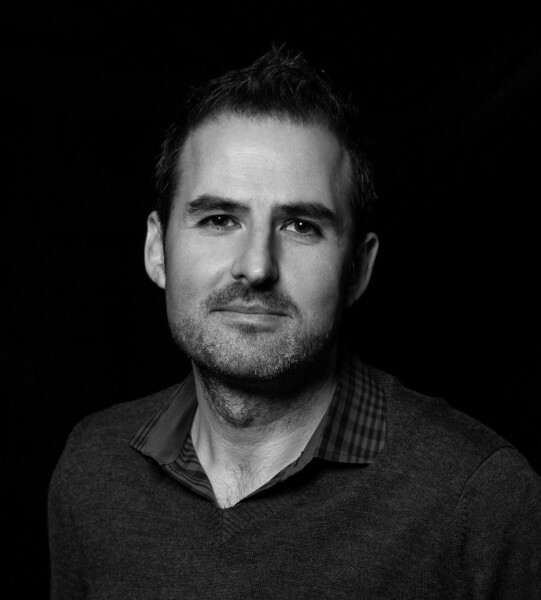 My buddy Mike Caspar has another great story about the use of Agile in the classroom, and in particular, how he has had an impact as a coach. I wrote this article for our Real Agility Newsletter, but I wanted to share it here too, just in case some of you don’t get it. I think this is important to share because it gets to some of the deep values of Agile and good teamwork. The team really is important. Last month I wrote about love. This month, I’ll write about commitment. Our team has gone through some extreme tests this last month. Commitment kept us together. Our business has been through crisis before. In the second half of 2005, my own financial mis-management led to near-bankruptcy for the business and for myself personally. My dear long-suffering wife and business partner, Melanie, kept things under control as we recovered. In late 2009 the Great Recession hit us hard and we had to cut our staff back to just Paul and myself by laying off three talented friends and cutting work to a loyal subcontractor. That was incredibly painful for everyone involved. A similar crisis occurred again in late 2011, although it wasn’t as severe. In September last year, our projections were showing a looming crisis… but we narrowly averted any layoffs when a smaller consulting deal closed and one person was let go for unrelated reasons. We still needed more work, and in late fall we were expecting to close three important deals. In January we knew we were in trouble. Business was not booming. In fact, those three important deals had fallen through with nothing obvious on the horizon to replace them. Our office management was in a shambles with two recent changes in staff and very little continuity. Our accounts receivable had several items that were waaaay overdue. We were starting to dig deep into our operating credit with no obvious way to climb back out. The partners, Paul, Travis, Melanie and I started to talk about serious stuff: deep layoffs. We were worried we may even have to cut all the way back to just me doing work (mostly CSM classes) – a staff level we haven’t seen since 2007! Two weeks ago, the four partners had an emergency weekend meeting after our early February attempts to build sufficient immediate cash flow failed. We consulted for over four hours around a single question: what should we do? Our projections were showing us running out of credit in just four weeks, our business development pipeline was almost empty and the few things in it were clearly long-shot deals, at least in the timeframe we needed. It seemed almost impossible to avoid deep layoffs. Our love for each other seemed almost irrelevant to the crisis, despite the depth of our feeling. The consultation was difficult and filled with despair. My memory for exact words is poor. I remember concepts, relationships and feelings. During that weekend consultation, one thing really stood out: we started to talk about commitment. We talked about what it would mean to be committed to each other and to the business vision of transforming people, process and culture. Most powerfully, we talked about the commitment of our newest employee, Nima, who seemed determined to go to the ends of the earth, to the very last moment to help us all succeed. As we talked about commitment, we came to our most powerful decision: sink or swim, we are all in this together to the end. After that critical point in our discussion, we set some goals, determined some important activities, and decided to go literally day-to-day in deciding if it was time to wrap up the business. And, strangely enough (I say ironically), we decided we needed to shorten our planning cycle from a month to two weeks, increase the discipline of our team’s interactions to bi-daily check-ins, create a detailed set of dynamic plans for the two weeks, and have a review meeting at the end of the two weeks. Sounds a bit like an Agile team, doesn’t it? What happened? Well, we’re still around. We’ve closed enough business that our projections are now showing us staying in a steady state financially for the next three months. That’s a dramatic turnaround from just two weeks prior. We aren’t going to run out of credit. In fact, we now have enough prospects that we expect to be extremely busy in just a couple more weeks. Our end-of-cycle review, which happened on Friday, was still difficult. There is still great uncertainty about many things. But the one thing that is crystal clear, strong as steel, and deep as the deepest ocean is our commitment to each other to succeed together. We are a true team. If you have similar stories to tell, I would love to hear them! Facing the facts early on. Risk Mitigation can be a powerful motivator. Recently, I was able to witness a remarkable event in a company that is relatively new to Agile. They have several teams at about Sprint 12, with several new teams just starting up. Many of their processes are waterfall based. A failed waterfall project was moved to an existing Agile Team. In the second Sprint, the Team (feeling trust in the organization and the process), came to the Scrum Master and said, “We’d like you to talk to management. We are not sure this project should be using the platform we develop on. We think another team’s platform may be more appropriate”. The company had spent time developing a “specification document” for this “project” before Agile was introduced. There were detailed specifications as to how the product was to be created and which platform to use. NONE of this was done with the benefit of asking those that would actually be doing the work. The project was initiated before learning about applying Agile. One developer was tasked with following the specification. After 2-3 months of frustration, the developer left. This left the company in a bad position. Not only was the project incomplete, but there was also no knowledge transfer. The project was basically stopped. As Agile was now the new target way of doing things, the project (and new developer hired through the previous process) were added to an existing SCRUM team. The team is using one week Sprints. After only two Sprints (two weeks), the team had recognized the futility of the approach that was “specified” and took this to management. Traditionally, large organizations staff for projects. In an environment such as this, how could team members be expected to be truthful and honest about the state of affairs? It would mean the end of their jobs or contracts. The key here is to allow teams to stick together. Not only will you avoid losing all the efficiency the team has built up, but you will also allow them to be truthful about their situation. If you are a manager reading this, ask yourself. “Do I want to know that things will go wrong at the beginning of the project or wait until 5 months have gone by to be told, ‘We knew it would never work””. Or even worse… “We knew the product owner was asking for ridiculous features that had no Return on Investment for the company, but hey, you hired us for this contract. We just follow instructions”. As it turned out, the project did continue with the current team, but with some changes to the specification. The parts of the system that were going to be problems in 5 months were re-evaluated and were removed as they really did not have any real value to the company. It was then decided to stick with the same platform. Discussions did occur regarding moving to the alternate platform, but were deemed unnecessary after open discussion between the teams and the managers involved. Realistic expectations were set based on value to the company. Sometimes features are absolutely mandatory for the product. This cannot and should not be taken away from the process. What we gain here is that we are able to have a discussion about necessity. In the end, the business has to decide what is valuable, not the development team. In a case like this, ask yourself, “If my team is very against this, maybe I should at least think about it”. The company is working in a very short iterative environment, they quickly recognized a flaw in the system design and dealt with it after only 2 weeks into a several month project. Working incrementally allows the company to “Inspect and Adapt” on a regular basis. This has to include the question, “Does this still make sense?”. If you need to go backwards, let it be to reverse one or two Sprints of work, not months, or even years. Fortunately, for the company, the product will come out on time, with appropriate technology based on Return on Investment, and likely with significant cost savings over the initial design. This will also allow the team to get started on other high value projects. Talk about win-win. This project could have gone to another team. It would not have been negative for the first team. The next project would have just come down the pipe for them. The early signs helped adjust the “expectations” and everyone is moving forward with a clear understanding that they are on a more appropriate path going forward. For those of you out there trying to convince companies (or yourselves) that Agile is an effective framework, don’t be afraid to talk about “RISK MITIGATION“. Think about it this way; The company wants to know early on that there will be a problem, not near the end of the project. This is part of the purposeful transparency of any Agile framework.